As I’ve received a number of emails over the years on the subject, I’ve created this new section on my central site for those wanting to know about the business of writing. There has been so much on the craft, but so little on the actual business, so, thought appropriate that I share with you the lessons learned over the years since I started writing professionally in 1994 (I started writing with intent in 1989, but it wasn’t until 1994 that I could live solely off my writing), and even lessons from the business of communications, that I entered in 1983, as a teenage photojournalist in Thailand. These are lessons that I’ve either learned personally, or gained from writer friends in the business, who were so helpful to a newbie, struggling writer that I was back then, and new lessons they have been kind enough to share with the professional that I am now. Martin Eden is Jack London’s autobiographical novel published in1909, about a protagonist reaching for and getting publishing gold, going through all the psychological and societal dilemmas and conflicts. Yes, definitely not an uplifting story, but it was referred to me when I was just getting into the business, and it fortified me against the rising stack of rejection letters. Yep, you’ll get a stack of those…unless you never submit your work. What Martin Eden teaches is how to understand the difference between “good writing” and writing that the editor or agent doesn’t personally like. Or as of late, they think they can’t sell. Or, better yet, work that they don’t really want to put the energy into selling. If you’ve dealt with literary agents who make you wonder why you’ve got an agent, you probably understand this well. I'm along Dean Koontz's way of thinking when it comes to agents. Stay at it long enough, you’ll get the crowning glory of editors fighting over an auction to purchase what they had previously rejected. When I read Martin Eden, and how so little has changed in traditional book and magazine publishing in over 100 years, I was floored. If you’re getting into novel writing, I also highly suggest one of my prior teachers. I took Jim Frey’s writing class at Berkeley when I returned from my hiatus from the Lower 48 in 1991. No, he’ not that wanker who performed his fiction/non-fiction marketing coup on Oprah). James N. Frey is probably one of the best instructors in storytelling and setting up your manuscript, especially if your focus is mystery or thrillers. He’s got an excellent collection of bestselling books on the subject of writing. As for news on what I’ve been learning and sharing on the subject of writing and publishing, I’ve created a For Writer's Section off my central blog for you. I look forward to sharing my writer’s life lessons with you there! 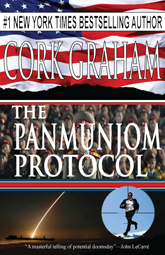 The Panmunjom Protocol, on sale July 4, 2013!